Surround yourself with good people. Whenever possible I like to read / watch / listen to positive people. There is grounded, honest and real talk to be found, which I gain confidence and inspiration from. I've been following the Creative Women's League on instagram since it started. Kate is genuine and enthusiastic, and the network she's developed is so awesome. 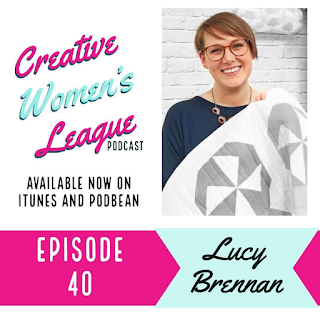 With two episodes a week, the Creative Women's League podcast is packed full of motivation and encouragement. I was thrilled (and also nervous) to be on this week's show. We chat about some of my random life experiences, motherhood, how I got started quilting and how that led to being on telly, along with a few tangents! Plus I prove I can be a real geek.